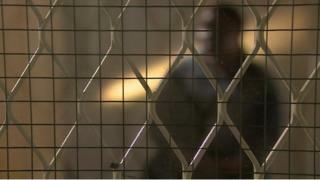 The prisons watchdog has described a controversial immigration removal centre as a "place of national concern". The report from Chief Prisons Inspector Nick Hardwick calls for the government to rethink how and why women are held at Yarl's Wood in Bedfordshire. One woman who was held there, told BBC News her story. Twenty-two-year-old Mary - not her real name, arrived at Yarl's Wood Immigration Removal Centre in the dead of night. In the darkness she passed through many locked and chained doors, was searched twice and finally taken to a bedroom where she could just about make out that someone else was sleeping there. A couple of hours rest were broken by a sudden commotion. "At about 5.30, the lady in the other bed was going to be taken to the airport. She was refusing and she was dragged out of the room by two large officers. That was my first night…and it was very frightening for me. I just think, 'it's going to be me next', I was going to be dragged out of the room." Mary had arrived in London from Africa in August 2014 and she claimed asylum. She says she was running away from her father who wanted her to undergo female genital mutilation and then force her into an arranged marriage. When she arrived for her first interview in September immigration officials immediately detained her and took her to Yarl's Wood. In broken English, she described that her three months there had been were horrific. "Yarl's Wood is the most bitter experience I've ever had in my life," she said. "Within two months and two weeks I feel there is no reason for me living, because in Yarl's Wood there's no life, the way the officers treat you, with no respect for you. It hurts to just think about it. I spent most of my time crying and not looking around." Simple things like getting hold of sanitary pads, become an ordeal. Mary recalls having to tell a male officer in charge of handing out toiletries that she needed a sanitary towel - he told her to come back later because he was busy. Health issues were another concern. "I had a blackout, I'd never had a blackout before and I reported it to the doctor. It took them about four to six days for an appointment date, and when you went for the appointment, they say, 'you're ok' - but I had a blackout, they never checked what happened." "It's always like that when you want medicine, when you need something from the health facility they tell you you're ok, nothing is wrong with you." But the most harrowing thing about being locked up at Yarl's Wood, she said, was not knowing what the future holds. "It affects you because you don't know, you're not even sure what's going to happen. You're asleep and the next moment there are flight tickets under your door - you've been given flights back to your home. "You might just be sitting and an officer says, 'you need to go to the legal room'. You go to the legal room they tell you have a flight scheduled for three days' time. It's like you don't know anything, you're blind, you don't see anything." Mary questions why she was in the removal centre in the first place - she was living with members of her family, had arrived in the United Kingdom with a visitor's visa and obeyed the rules which applicants applying for asylum must abide by. Campaign groups like Women for Refugee Women, who have helped Mary, argue that too many people are unnecessarily held in immigration detention. The Home Office says that detention and removal are "essential parts of effective immigration controls" - but that it also wants all those who are held to be treated with "dignity and respect". It says that those who are detained should only be held for the shortest period necessary and officials regularly review each case. But in its latest report on the centre, the prisons watchdog said that while 443 women had been removed from the UK in the six months before its inspection, just over twice that number were released back to the community. Mary was one of those who was released. She left the centre in early 2015 after winning her argument that she was not a flight risk. Today, she is waiting for news of her application to remain in the country - but she fears being returned to Yarl's Wood. "It's like a cage where you lock up people," she said. "When you're there, there's no light in your life. I know what Yarl's Wood is like and I don't want to be in Yarl's Wood ever again."